Slideways Go Karting Australia | Valentine’s Day Special at Slideways Go Karting Centres! Valentine’s Day Special at Slideways Go Karting Centres! Home News and updates Valentine’s Day Special at Slideways Go Karting Centres! Couples who drift together, stay together! 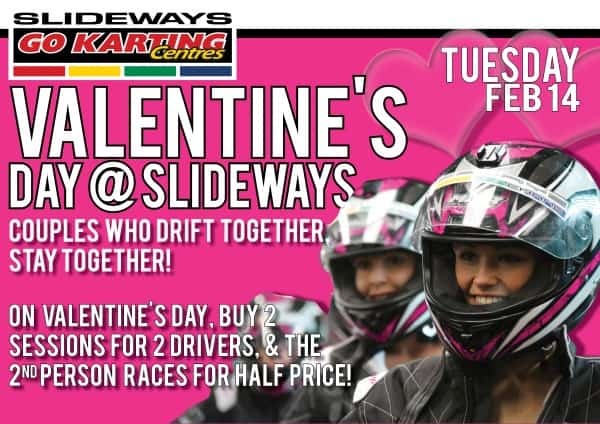 Don’t forget – Valentine’s Day is coming up on Tuesday February 14th, and we would love for you to share the special day Slideways style! Click here for our event on the Slideways Go Karting Gold Coast Nerang Facebook page! Click here for our event on the Slideways Go Karting World Pimpama Facebook page! Click here for our event on the Slideways Go Karting Brisbane Facebook page! To celebrate, all three Slideways Go Karting Centres throughout the day will be offering two sessions for two drivers, with the second driver paying half price! This special applies to the above combination on adult karts only, and means you get two people for two sessions each, for a total of $99. Standard Slideways membership requirements apply. All venues will be open as per normal throughout the day, and as always, we recommend phoning ahead to make a booking.